Vinyl siding is manufactured in a variety of shapes, sizes and styles as well as colors and thicknesses. If you are considering installing vinyl siding, you should learn how to select a quality product and find a proficient contractor who can perform the work. Proper installation is just as important as the product’s quality. As with most materials, vinyl siding is available in a variety of quality levels ranging from economy grade (inexpensive) to premium grade (pricey). Midgrade products generally provide the durability and appearance that most people want and can afford. This guide will explain how to evaluate the vinyl products used to clad residential properties. Thickness is the first way to distinguish cheap siding from higher-grade materials. The depth prevents sagging while providing better impact resistance and durability. The American Society of Testing and Materials (ASTM) Standard 3679 created the standards used to rate siding. The designation should be included on the product fact sheets and packaging. This guideline outlines the minimum standard. Panels should be at least 0.040 inches thick; 0.042 to 0.045 is better. The ASTM standard requires only 0.035 inches. Soffit panels should be about 0.05 inches thick. Because soffits are installed horizontally and secured only at the edges, the extra thickness helps to prevent the panels from sagging. The manufacturing process as well as the composition of the product determines it strength, rigidity and durability. When evaluating a product, research how it is made. Polyvinyl chloride or PVC is the primary ingredient in vinyl siding. Higher-grade materials will have acrylics applied to the top layer, known as the cap stock, to make it harder. Typically made from repurposed, melted plastic, this siding is usually the least expensive. A drawback is that the finished color is usually only applied to the front. It is sometimes referred to as “grayback” because of its reverse side color. Rather than use a variety of old plastic, this slightly higher-grade material uses only ground-up, repurposed PVC to create a purer regrind. This is the purest form of PVC siding. Because it is manufactured from original polyvinyl chloride, it is more resilient and durable. This is the minimum quality level siding that you should install on your home. Manufacturers have developed proprietary formulas to increase the performance of their vinyl siding by adding UV stabilizers, hardeners and other chemicals. The various types and ratios of these additives determine the quality of the siding. 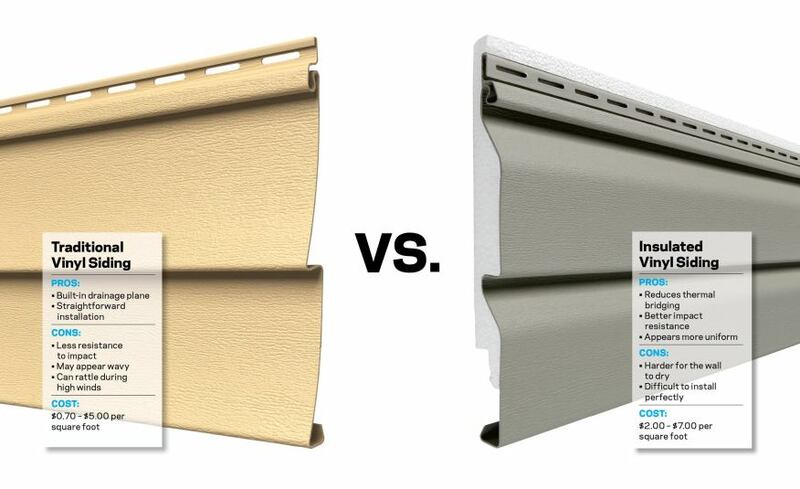 A new product that utilizes acrylic at the core of the siding with a vinyl exterior. The fast-fading vinyl siding that was common years ago has been replaced with more colorfast products. To ensure that you get the best colorfastness, look for siding that contains titanium dioxide. This additive inhibits fading to prevent noticeable color changes from year to year. True colorfast siding is independently certified in accordance with ASTM D6864, ASTM D7251 or ASTM D7856 guidelines. Look for the certification imprinted on the box or ask the sales representative. The deeper the profile of clapboard style siding, the more shading it will produce when installed. Look for a clapboard profile that is at least ¾” deep for the most authentic appearance. The additional depth mimics the effect of natural wood siding. It is also likely to be more rigid and less wavy when installed. 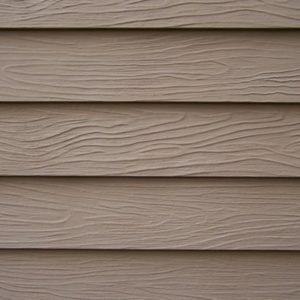 Premium grade vinyl siding will have deeper wood graining patterns to better replicate the look of natural painted wood. Most are available in a wider range of colors. You should also look for top siding materials that come with attractive accessories to put the finishing touches on your home. 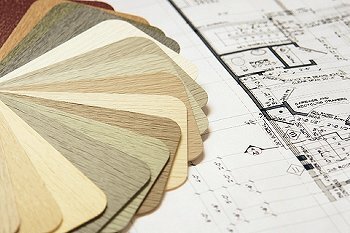 Every siding manufacturer has a unique coloring process. The success or failure of this process is a key factor in determining the quality of siding. The companies with the best process will stand behind their products with a great warranty against fading. Select a product that has color throughout the panel. Check the back, and make a test cut if necessary. Insist on a product with titanium dioxide. The chemical is proven to help stop UV degradation in a wide variety of materials. Choose high-quality pigments. Better pigments and higher concentrations throughout the vinyl have a huge impact on how well the color lasts. The least expensive, lower quality grades of siding come with a 5-year or 10-year warranty. You should look for a product with at least a 25-year guarantee. The highest quality siding products are backed by lifetime-limited warranties against manufacturing defects. In some cases, the lifetime warranty can be transferred to the next homeowner. Read the fine print associated with the warranty. Some warranties are prorated. The longer the siding lasts, the less the company will pay to fix the damage. The manufacturer may only offer to re-coat the siding rather than replace the damaged sections. Most warranties only pay for the product, not the labor costs for installation. When choosing siding, consider other features that can enhance its appearance and durability. 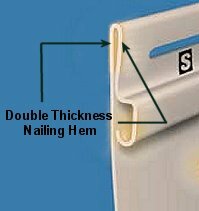 Double-Hem Nailing Area: The nailing hem is the location where fasteners are installed through the siding in order to secure it to the sheathing. A double hem allows for more nails. This increases the siding’s wind resistance. The best vinyl siding has a double-layer mounting hem, which provides for a stronger attachment than a single-layer hem does. Extra-Long Panels: To create a smoother look, consider using 16-foot-long or longer panels. This limits the number of seams on your unbroken walls. Finish: For fiber cement, determine whether the added color choices and cost savings of painting it yourself outweigh the longer durability and lower maintenance costs of a factory finish. Foam Backing: In addition to increasing the strength of the product, it enhances the insulating properties, which can reduce utility bills. These are the industry leading brands. The following is an overview of what they offer. All these top brands back their best products with lifetime, limited warranties. In most cases, the warranty is transferable to the new owner if the home is sold. Easily one of the top premium brands, CertainTeed’s best siding lines, such as Monogram and Monogram XL, meet or exceed all quality characteristics. These include enhanced thickness and colorfastness material as well as rigidity and durability. These products also have many attractive appearance options and a good selection of accessories. In addition to horizontal siding, CertainTeed makes vertical, shake & shingle and insulated siding with equal quality and distinction. Also among the country’s best brands, Alside covers all the bases. The company’s Premium Charter Oak horizontal siding is offered in 19 colors. You will find similar options for the manufacturer’s vertical siding, shakes and scallops. While Alside’s Prodigy line is the thickest insulated siding in the industry, its multitone Cypress Creek variegated siding provides an elegant, textured appearance. Royal Building Products (RBP) offers siding options that range in quality from better to best in attractive horizontal and vertical profiles to give your home just the look you want. Their products mimicking cedar shakes and shingles are available in 20 colors and feature enhanced thickness to produce a more authentic profile. This industry-leading producer of building materials offers a full range of siding. Horizontal siding like the best-selling Compass line is produced in a variety of profiles and styles as well as 24 color choices. The company also creates vertical and insulated siding along with faux cedar shake siding in 15 colors. This brand has horizontal, vertical, insulated and shingle/shake siding in a variety of quality levels. The products are also offered in several different profiles and numerous colors so that you can tailor the appearance of your home to suit your lifestyle and personality. 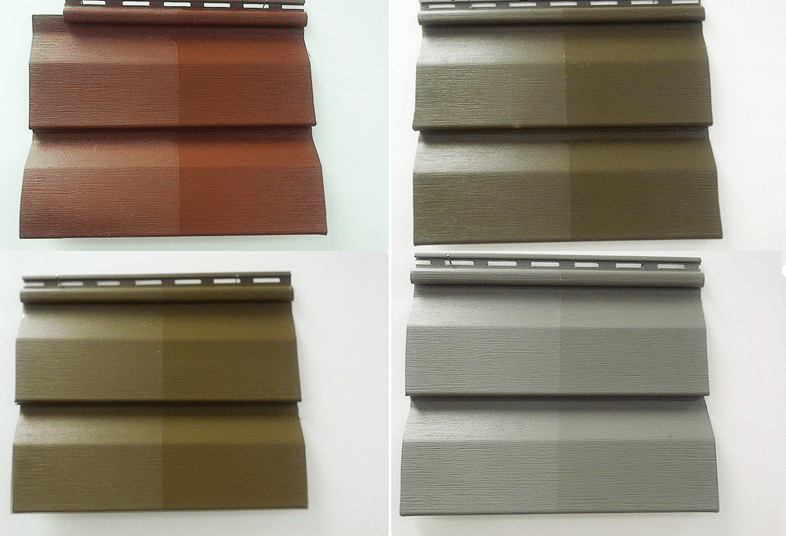 Their Quest horizontal siding, for example, is available in 7 profiles and 35 brilliant colors. While offering a limited number of lines, Exterior Portfolio still produces a variety of handsome options in a pleasing array of colors and styles, including horizontal, vertical, shake/shingle and insulated. The company’s top lines like American Dream Edge are available in several profiles and accessories as well as 14 colors allowing you to customize your home to your unique tastes. Another Ply Gem brand, Mitten offers higher quality siding. 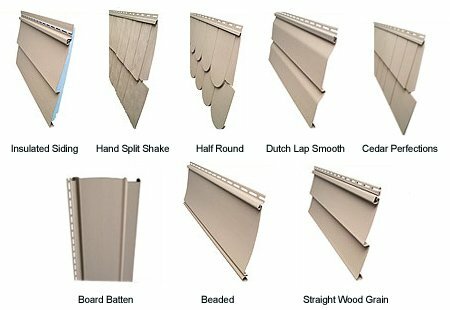 It manufactures a limited number of lines in all the major vinyl siding categories. Its popular Sentry horizontal siding is produced in 33 colors. This top siding manufacturer is best known for its horizontal siding lines, such as the extra-thick Sagebrush and the Blends Collection that boasts rich hues and deep wood grains. The company also makes all the other types of siding, including shakes, shingles and rounds. This Ply Gem siding company manufactures 13 horizontal siding profiles, including the popular American Splendor series in 26 colors. The company also offers a limited number of board and batten and shake and shingle siding lines. The insulation value of Napco insulated siding is among the highest in the industry. Kaycan offers horizontal siding with a wide range of profile and color options, including the Richmond line in nine heritage colors like Brick and Umber. Browse the company’s vertical, shake and shingle siding styles for similar appealing choices. All the national home improvement chains sell a large amount of siding in their stores and online. The number of retailers helps to keep prices very competitive. Here is what you will find when you venture out to big box stores or browse the internet. The Home Depot website will only show products that are currently in stock, but you can order siding from top national brands like CertainTeed, Mastic and Wolverine. Horizontal, vertical, insulated, shakes, shingles and accessory products are available in several luxurious textures and colors. As a result, putting together the best cladding package for your home and budget should not be an issue. This top national retailer sells an impressive range of siding with a heavy emphasis on products manufactured by Georgia Pacific. The lines being offered include horizontal traditional and Dutch lap profiles, vertical board & batten, shakes, shingles and scallops as well as a range of accessories. Lowes stocks good, better and best quality options to fit any budget. Like all the other major home improvement chains, most of the siding available from Lowes is not stocked in the store. It must be ordered. While this retailer offers the largest selection of products that can be ordered, its in-house stock is very limited. Menards offers siding from several leading brands, including CertainTeed, TimberCrest, Wolverine and ABTCO. Along with quality and price range, there are numerous appealing options in every siding type, profile and color. This online retailer offers many of the top brands, including CertainTeed, Mastic and Royal Building Products. Because ABC Supply carries many producers as well as all types and profiles in a rich palette of colors, the selection might be the best you will find online. This online seller primarily stocks the most popular types, profiles and colors rather than a wide spectrum of products. While the pricing is very competitive, the offerings are more limited than that typically available in a home improvement store or at ABC Supply. When it is time to replace your siding, you need to find a well-qualified installer and select the best quality product that you can afford. Although installation maybe offered by the retailer from whom you purchased your siding, the product and labor are two distinct aspects of a quality appearance. The manufacturer’s warranty usually does not cover any problems associated with the original installation or damage that may occur because of improper installation. As a result, it is important that the contractor understands how to install the particular siding product that you have chosen. Some companies provide warranties that cover installation problems if the homeowner agrees to hire their team to perform the job. Regardless, you need to ensure that you hire a quality and knowledgeable installer for the project. Discuss their work experience. It requires expertise to handle unique roof pitches, trim and home style. Make sure that they are knowledgeable and understand how to install the type of siding you have chosen. Ask whether the contractor will install a moisture barrier and if so, what type. The contractor should explain how the siding would be affixed to your house. If there is water or insect damage, can the contractor repair it or do you need another contractor to do the job. If your chosen siding requires a finish, make sure that the installer has experience applying the product. Ask when they plan to start, the installation costs and how long the project is projected to take. Determine who is responsible for cleaning up the job site when they are finished. Contact their references to determine whether the clients were satisfied with the company. You should ask whether the company completed the project by the specified time and within the allotted budget. A certified installer typically offers a warranty on their service. If they do, review the details of the warranty to see what is covered and for how long. Check with state licensing boards and local or state business associations to see if any complaints have been lodged against the installer you are considering. Ask about their certifications. Many major siding manufacturers offer certification programs so that installers receive the instruction required to install their products. Request at least 3-5 written estimates before hiring a remodeling contractor. Estimates are typically free, unless it is for a service call for a repair. To save money, obtain estimates in late fall or early winter. Aggressive pricing discounts may be available as this is typically the down season for contractors. Visit and closely inspect past jobs and a current project. Rigid insulation provides an even surface for the siding. It also adds some insulating value and lowers air infiltration. The joints between the insulation panels should be taped for maximum energy savings. This is a minor task but indicates quality and attention to detail. Corrosion-resistant nails: The contractor should use aluminum or hot-dipped galvanized nails. Straight courses: Examine both sides of windows and doors as well as corners. Panels should continue from one side to the next in perfect alignment for the best look. Uneven panels look sloppy. Detailing around openings: The J-channels should be neat and precise. Look for mitered corners and a smooth caulking application. A clean job site: Contractors should clean up and dispose of trash at the end of each day. Materials and tools should be covered and protected. Once you have selected an installation contractor, make sure you receive a detailed contract that describes the scope of the work to be performed and the payment schedule. The details should also include all siding costs, the length of time the job should take, the scheduled start date and the targeted completion date. Add any other details that you and your contractor agree to in relation to the installation job. While selecting any one of the top 10 companies would probably produce a quality product, the same cannot be said with local contractors. The quality of installation is far less certain. A contractor’s expertise and experience are essential to a quality installation. The main reason is the material. Because vinyl expands and contracts, even the most expensive materials will buckle and warp if they are not installed correctly. Experienced contractors take several precautions to ensure that this does not happen. These include installing panels with a 1/4-inch clearance at all openings and stops, such as where a panel meets a window or comes to the corner of the house. That clearance is increased to 3/8 inch if temperatures can drop below 32 degrees Fahrenheit. There should also be a row of slots at the top of each panel. The nails should be driven through the center of the slots with a slight gap between the nail head and siding, which allows each panel to move slightly with temperature changes. We’re interested to know – what grade and brand are you leaning towards and why? Let us know by leaving a comment below! Have a cabin right next to a lake. 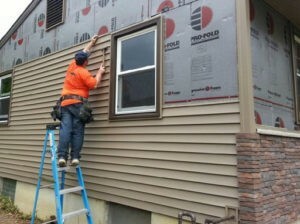 Without any experience regarding new siding I am trying to locate the best siding to use and the best installer. My cabin is located in Oneida County near Eagle River, WI. The information offered here is very helpful, and is exactly what I was looking for. each, and have not experienced any issues. In siding, I will stick with mid to high grade material. I’m 67, just painted the house, but will be to old to paint again. I want a low maintenance product that will look good for 15 to 25 years. Again thank you. I have 3 pages of notes. We are leaning towards Certainteed’s Cedar Impressions. We are thinking of removing 45 yr. old wooden cedar shakes and replacing with Cedar Impressions vinyl shakes to not have the continued upkeep with sealing and replacing shakes that fall off and to get rid of the woodpecker problems all wooden shakes will get. Please for resale, most people looking for a home want maintenance free now. We also did not like the dark brown look of the house when we bought it. I like the golden new shake look and don’t want it to change in a few years. We have neighbors who have Certainteed’s Cedar Impressions and are very happy with them. We’ve watched how they’ve weathered over time, and were pleased. Still not sure what vinyl siding to buy. Our neighbors window is melting our vinyl siding. With the new vinyl siding coming out on the market is there one that will help or stop this problem all together? We are not sure if our neighbors will do anything about the problem.